When it comes to field repairs there’s nothing that duct tape can’t fix. But who wants to carry a big roll of 100 mph tape in their rucksack? The Duct Tape Field Kit by McNett® Tactical is your compact and lightweight solution to big, bulky rolls of duct tape. Featuring two, 2’’ x 50’’ pocket-sized rolls of OD Green and Tan colored tape, the Duct Tape Field Kit is guaranteed to save the day, many times over. This tacky repair tape is easy to tear and bonds to almost any surface. 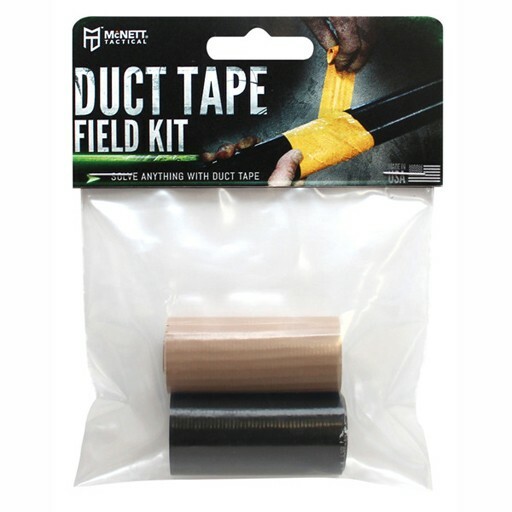 When equipment fails or breaks, solve the problem with the Duct Tape Field Repair Kit by McNett® Tactical. They don’t call it 100 mph tape for nothing.